Newest materials and materials on Mythical Creatures. Find out about mysteries, stories and handy advice on Mythical Creatures. 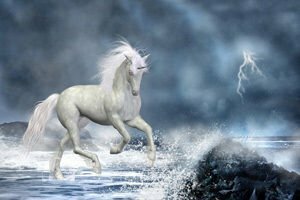 Read the newest articles and publications about Mythical Creatures. Analysis of the fossils of Elasmotherium sibiricum proves that unicorns were not mythical creatures but really did exist 29 000 years ago. However, they did not look as cute as depicted in children's stories. An angel with large outspread wings is a sign of upcoming good news. Oftentimes, an angel appears in a dream to help you resolve some type of serious problem. Do mermaids, unicorns, dragons, fairies and elves really exist? Many claim that these are products of the imagination, but some stories refute the existence of mythical mermaids. Do mermaids, unicorns, dragons, fairies and elves really exist? Many argue that this contraption is nonsense, but some myths stories have rebutted the existence of those mythical creatures. Another Giant Skeleton in Yakutia?